The last few days have not been a good one, with the campus losing one of its own in the shooting in Colorado, as well as the death of a space pioneer. People have been taking to the Internet to express their sorrow over these losses. This week’s featured title deals with just that, exploring how the Web and online networks have changed the grieving process and its implications. 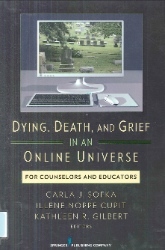 Sofka, Cupit, and Gilbert, professors at Siena College, Temple University and Indiana University, respectively, have compiled chapters from leaders in the field of “thanatechnology,” which studying the use of communication technology in the areas of death education, grief counseling, and thanatalogy [the study of death] research. The work is divided into sections about the general impact of technology on death and the healing process, social networking’s role in community building, websites as information portals, and an outlook into the future. Written for practitioners, the assembled reader provides a glimpse into how technology can be utilized in professional settings to assist individuals in coping with end-of-life issues. This entry was posted in new stuff tuesdays and tagged books, death, dying, grief, new stuff, psychology, sociology, technology. Bookmark the permalink.